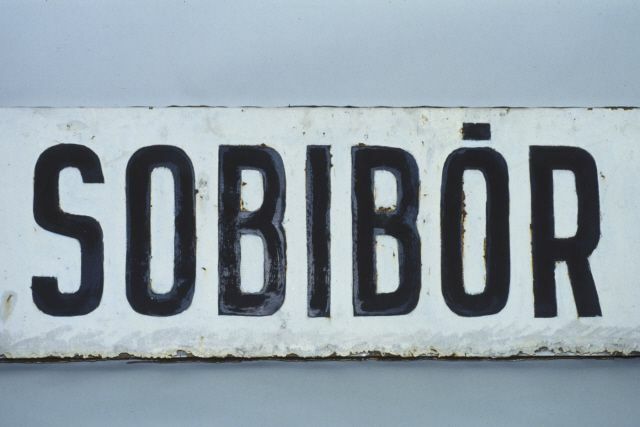 Sign for the train station at Sobibor. (1930). Picture from the United States Holocaust Memorial Museum, courtesy of Polskie Koleje Panstwowe S.A.
Jews have often been accused of going to their deaths during the Holocaust like "sheep to the slaughter," but this just wasn't true. Many resisted. However, the individual attacks and the individual escapes lacked the zest of defiance and craving for life that others, looking back in time, expect and want to see. Many now ask, why didn't the Jews just pick up guns and shoot? How could they let their families starve and die without fighting back? However, one must realize that resisting and revolting were just not this simple. If one prisoner were to pick up a gun and shoot, the SS would not just kill the shooter, but also randomly choose and kill twenty, thirty, even a hundred others in retaliation. Even if escaping from a camp were possible, where were the escapees to go? The roads were traveled by Nazis and the forests were filled with armed, anti-Semitic Poles. And during the winter, during the snow, where were they to live? And if they had been transported from the West to the East, they spoke Dutch or French - not Polish. How were they to survive in the countryside without knowing the language? Although the difficulties seemed insurmountable and success improbable, the Jews of the Sobibor Death Camp attempted a revolt. They made a plan and attacked their captors, but axes and knives were little match for the SS's machine guns. With all this against them, how and why did the prisoners of Sobibor come to the decision to revolt? During the summer and fall of 1943, the transports into Sobibor came less and less frequently. The Sobibor prisoners had always realized that they had been allowed to live only in order for them to work, to keep the death process running. However, with the slowing of the transports, many began to wonder whether the Nazis had actually succeeded in their goal to wipe out Jewry from Europe, to make it "Judenrein." Rumors began to circulate—the camp was to be liquidated. Leon Feldhendler decided it was time to plan an escape. Though only in his thirties, Feldhendler was respected by his fellow inmates. Before coming to Sobibor, Feldhendler had been the head of the Judenrat in the Zolkiewka Ghetto. Having been at Sobibor for nearly a year, Feldhendler had witnessed several individual escapes. Unfortunately, all were followed by severe retaliation against the remaining prisoners. It was for this reason, that Feldhendler believed that an escape plan should include the escape of the entire camp population. In many ways, a mass escape was more easily said than done. How could you get six hundred prisoners out of a well-guarded, land mine-surrounded camp without having the SS discover your plan before it was enacted or without having the SS mow you down with their machine guns? A plan this complex was going to need someone with military and leadership experience. Someone who could not only plan such a feat but also inspire the prisoners to carry it out. Unfortunately, at the time, there was no one in Sobibor who fit both these descriptions. On September 23, 1943, a transport from Minsk rolled into Sobibor. Unlike most incoming transports, 80 men were selected for work. The SS were planning on building storage facilities in the now empty Lager IV, thus chose strong men from the transport rather than skilled workers. Among those chosen on that day was First Lieutenant Alexander "Sasha" Pechersky as well as a few of his men. Sasha was a Soviet prisoner of war. He had been sent to the front in October 1941 but had been captured near Viazma. After having been transferred to several camps, the Nazis, during a strip search, had discovered that Sasha was circumcised. Because he was Jewish, the Nazis sent him to Sobibor. It seemed an impossible task. Yet Sasha attacked the stump "[w]ith all my strength and genuine hatred. "2 Sasha finished in four and a half minutes. Since Sasha had completed the task in the allotted time, Frenzel made good on his promise of a pack of cigarettes - a highly prized commodity in the camp. Sasha refused the pack, saying "Thanks, I don't smoke. "3 Sasha then went back to work. Frenzel was furious. Frenzel left for a few minutes and then returned with bread and margarine - a very tempting morsel for all who are really hungry. Frenzel handed the food to Sasha. Again, Sasha refused Frenzel's offer, saying, "Thank you, the rations we are getting satisfy me fully." 4 Obviously a lie, Frenzel was even more furious. However, instead of whipping Sasha, Frenzel turned and abruptly left. This was a first in Sobibor - someone had had the courage to defy the SS and succeeded. News of this incident spread quickly throughout the camp. These words motivated the prisoners of Sobibor. Instead of waiting for others to liberate them, they were coming to the conclusion that they would have to liberate themselves. Feldhendler had now found someone who not only had the military background to plan a mass escape, but also someone who could inspire confidence in the prisoners. Now Feldhendler needed to convince Sasha that a plan of mass escape was needed. The two men met the following day, on September 29. Some of Sasha's men were already thinking of escape—but for just a few people, not a mass escape. Feldhendler had to convince them that he and others in the camp could help the Soviet prisoners because they knew the camp. He also told the men of the retaliation that would occur against the whole camp if even just a few were to escape. Soon, they decided to work together and information between the two men passed via a middle man, Shlomo Leitman, so as not to draw attention to the two men. With the information about the routine of the camp, layout of the camp, and specific characteristics of the guards and SS, Sasha began to plan. Sasha knew that any plan would be far-fetched. Even though the prisoners outnumbered the guards, the guards had machine guns and could call for back-up. The first plan was to dig a tunnel. They started digging the tunnel in the beginning of October. Originating in the carpentry shop, the tunnel had to be dug under the perimeter fence and then under the minefields. On October 7, Sasha voiced his fears about this plan - the hours at night were not sufficient to allow the entire camp population to crawl through the tunnel and fights were likely to flare-up between prisoners waiting to crawl through. These problems were never encountered because the tunnel was ruined from heavy rains on October 8 and 9. Sasha began working on another plan. This time it was not just a mass escape, it was a revolt. On the nights of October 11 and 12, Sasha told the Underground the complete plans for the revolt. The Soviet prisoners of war were to be dispersed to different workshops around the camp. The SS would be individually lured to the various workshops either by appointments to pick up finished products they had ordered like boots or by individual items that attracted their greed like a newly arrived leather coat. Each SS man would be killed in the workshops. It was important that the SS did not cry out when being killed nor any of the guards alerted that something unusual was happening in the camps. Then, all the prisoners would report as usual to the roll call square and then walk out together through the front gate. It was hoped that once the SS had been eliminated, the Ukrainian guards, who had a small supply of ammunition, would acquiesce to the revolting prisoners. The phone lines were to be cut early in the revolt so that the escapees would have several hours of fleeing time under the cover of darkness before back-up could be notified. Significant to the plan was that only a very small group of the prisoners even knew of the revolt. It was to be a surprise to the general camp population at roll call. It was decided that the following day, October 13, would be the day of revolt. The day had finally arrived. Tension was high. In the morning, a group of SS arrived from the nearby Ossowa labor camp. The arrival of these additional SS not only increased the man power of the SS in the camp but could preclude the regular SS men from making their appointments in the workshops. Since the additional SS were still in the camp during lunchtime, the revolt was postponed. It was rescheduled for the following day - October 14. As the prisoners went to bed, many were afraid of what was to come. The day had come. Excitement among the prisoners was so high that no matter what happened, the revolt could not be postponed, for the SS were sure to notice the change in mood in the prisoners. The few weapons that had been made were already handed out to those doing the killing. In the morning, they all had to try to look and act normal while waiting for the afternoon to come. Something unusual happened. SS Unterscharführer Walter Ryba, armed with a submachine gun, came into Lager I and took four prisoners away with him. SS didn't usually carry such heavy weapons. Could he know about the planned revolt? Sasha found out that SS Ryba was only carrying the submachine gun because a Ukrainian guard had not also accompanied the prisoners.Many of the battle teams take their positions. Vorlager: Leon Feldhendler was stationed here to help orchestrate the revolt in this section of the camp.Unterscharführer Josef Wulf: Wulf was the first SS man killed during the revolt. Once he entered the storeroom, one prisoner offered him a coat and another helped him into it. While he was putting on the coat, two other prisoners hit him on the head with axes. Wulf's dead body was then hidden among piles of clothes and the blood was cleaned up. Steubel: Steubel was also lured into the storeroom and killed. Scharführer Vallaster: Killed during revolt; circumstances of death not known. Scharführer Kurt Beckman: While the attempt to lure Beckman to the storeroom for a new leather coat started successfully, on his way he abruptly turned around and went to his office. A little later, three prisoners went to Beckman's office where they surprised him and stabbed him with daggers. Since they did not have time to hide his body or clean up the blood, they left the body behind the desk. Unterscharführer Walter Ryba: Not part of the planned killings, Ryba entered the SS garage and was killed by a prisoner working there. Sasha worried that Ryba's body, which was very close to the SS and Ukrainian living quarters, would be discovered. Lager I: Sasha Pechersky was stationed here to orchestrate the revolt in this section of the camp.Untersturmführer Josef Niemann: The acting commander of the camp rode up to the tailor shop on his chestnut horse, dismounted, and went inside. As he was being fitted for a new uniform, prisoners hit him on the back of the head with an axe. His body was then dragged to the back room and his horse taken back to the stables. Oberscharführer Goettinger: Head of Lager III, Goettinger was asked to try on a new pair of boots in the shoemaker's shop. While talking to the shoemaker, Goettinger's head was smashed with an axe. Scharführer Siegfried Greischutz: Head of the Ukrainian guard, Greischutz was killed once inside the Ukrainian tailor shop. Klat: Klat, a Ukrainian guard, entered the tailor's shop looking for his boss, Greischutz (who had just been killed there). The tailors maneuvered Klat so that his back was to the back room. He was then attacked and killed. Scharführer Friedrich Gaulstich: Gaulstich was killed in the carpentry workshop. A Ukrainian guard discovered the body of Scharführer Beckman behind his desk and ran outside where SS men hear him yell, "A German is dead!" This alerted the rest of the camp to the revolt. The prisoners at the roll call square yell, "Hurrah!" Then it was every man and woman for themselves. Prisoners were running to the fences. Some were trying to cut them, others just climbed over. Yet, in most places, the minefield was still fully in place. As the remaining SS were alerted to the revolt, they grabbed machine guns and began shooting into the mass of people. The guards in the towers were also firing into the crowd. The prisoners were running through the minefield, over an open area, and then into the forest. It is estimated that about half the prisoners (approximately 300) made it to the forests. Once in the forests, the escapees tried to quickly find relatives and friends. Though they started off in large groups of prisoners, they eventually broke into smaller and smaller groups in order to be able to find food and to hide. Sasha had been leading one large group of about 50 prisoners. On October 17, the group stopped. Sasha chose several men, which included all the rifles of the group except one, and passed around a hat to collect money from the group to buy food. He told the group that he and the others he had chosen were going to do some reconnaissance. The others protested, but Sasha promised he'd come back. He never did. After waiting for a long time, the group realized that Sasha was not going to come back, thus they split into smaller groups and headed off in different directions. After the war, Sasha explained his leaving by saying that it would have been impossible to hide and feed such a large group. But no matter how truthful this statement, the remaining members of the group felt bitter and betrayed by Sasha. Within four days of the escape, 100 of the 300 escapees were caught. The remaining 200 continued to flee and hide. Most were shot by local Poles or by partisans. Only 50 to 70 survived the war. Though this number is small, it is still much larger than if the prisoners had not revolted, for surely, the entire camp population would have been liquidated by the Nazis. 1. Alexander Pechersky as quoted in Yitzhak Arad, Belzec, Sobibor, Treblinka: The Operation Reinhard Death Camps (Indianapolis: Indiana University Press, 1987) 307. 2. Alexander Pechersky as quoted in Ibid 307. 3. Alexander Pechersky as quoted in Ibid 307. 4. Alexander Pechersky as quoted in Ibid 307. 6. Thomas Toivi Blatt, From the Ashes of Sobibor: A Story of Survival (Evanston, Illinois: Northwestern University Press, 1997) 144. 11. Yehuda Lerner as quoted in Ibid 327. 12. Richard Rashke, Escape From Sobibor (Chicago: University of Illinois Press, 1995) 229. 13. Ada Lichtman as quoted in Arad, Belzec 331. 14. Ibid 364. Arad, Yitzhak. Belzec, Sobibor, Treblinka: The Operation Reinhard Death Camps. Indianapolis: Indiana University Press, 1987. Blatt, Thomas Toivi. From the Ashes of Sobibor: A Story of Survival. Evanston, Illinois: Northwestern University Press, 1997. Novitch, Miriam. Sobibor: Martyrdom and Revolt. New York: Holocaust Library, 1980. Rashke, Richard. Escape From Sobibor. Chicago: University of Illinois Press, 1995.